Your content should showcase your brand’s expertise, and meet your audience’s needs. Content must be engaging and meaningful to earn a targeted readership. And a little bit of entertainment doesn’t hurt, either. To truly build clout with your audience, a strategic approach to developing that content is a must. Let us help. Assess the reverence, resonance and reaction your content garners; identify opportunities in your current content plan and use those as a baseline to build upon. Thoughtfully and artfully combine business objectives, audience demographics and SEO data to create a content strategy that fits your business and, most importantly, your readers. What do you want your audience journey to look like? We tailor content plans to your customer and their needs. Solid content brings immense value to the audience – let us put our creative brains to work for your brand and create the precise mix of wit and food for thought leadership. Wouldn’t it be great to be able to dig so deep into your content that you’re able to pinpoint which phrase turned into a conversion? That’s nothing – let us show you the real magic happens. “Content isn’t king — It’s the kingdom!” – Lee Odden. In the early days of content marketing, just making great content was enough to rule the kingdom. These days, “great” is the table stakes. To take the throne, you need best answer content designed for strategic amplification. Being the best answer is also about moving your KPIs. Imagine being found on page 1 of Google, increasing your website traffic, improving engagement — and ultimately conversions, with your content. 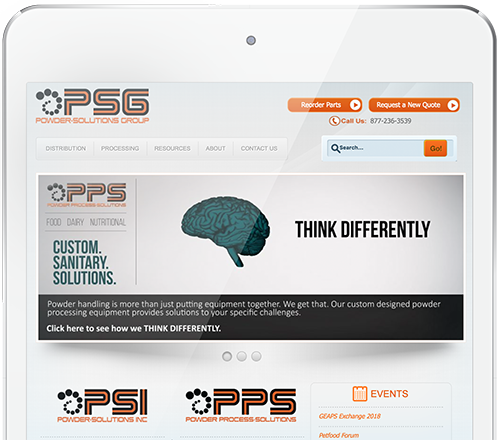 Check out how we leveraged an integrated Content Marketing Campaign for Powder Solutions that drove big increases in traffic, search visibility and conversions. If you want "fill up space on your company blog" content, we're not for you. But if you want "reach your audience, inspire action, and drive measurable business results" content, we have a dedicated team standing by. How is your current content performing? We dig deep to determine if your content hits the mark: Is it relevant? Does it resonate? Does it get your audience to react? Beyond that, is it actually being found, and by the right readers? Our content marketing audit helps assess your existing content and create actionable recommendations for optimal, long term performance. Don’t commit random acts of content. Your content marketing strategy should combine business objectives with audience targeting and SEO research. We can help you create relevant, engaging content that’s a measurable asset to your business. A killer content plan should be built on a solid foundation and map to your audiences journey. Our plans align with your funnel so that you achieve maximum impact. Remember, the best plans do no focus on the business, rather they focus 1000% on the readers’ need. If you need creative, entertaining content that makes a human connection and provides real value, let’s talk today! We meet your audience wherever they are on their journey, while helping them form a relationship with your brand and boosting your thought leadership. Measurement is the final crucial piece of successful content marketing. We take a data-driven approach to content measurement – down to the letter. We evaluate each piece – and channel – against your KPI’s to ultimately maximize results! That’s nothing – let us show you how the real magic happens.